Thanks to a lot of perfect timing and Divine appointments, I’ve been blessed to go deep inside (so to speak!) the world of fighter planes. Either working for aviation publications or within the airshow industry, I am constantly delighted by opportunity to spend time in places many dream of going, but darn few actually arrive. It matters little how many times I’ve gotten to do it; it’s more important to note the experience takes my breath away every…single…time. To say I am grateful would be an understatement, and I’d like to share a few things about that world with you. The best thing about fighters has nothing to do with actually flying them. You may find that difficult to believe, but it’s a fact. Strapping on fifty or sixty thousand pounds of state-of-the art, death-dealing hardware and roaring up into the heavens is a privilege and it’s every bit as awesome as you can imagine; however, what makes it great isn’t the technology, the ability to rain down hate and judgment on your enemies, breaking the sound barrier, or pulling a lot of Gs. Simply-stated, it’s the people who fly them. “Wyatt” and “Moon” read over the maintenance logbook prior to launch for a Large Force Exercise at Seymour Johnson AFB, NC. It’s no secret most of my best friends, male and female alike, wear bags and G-suits for a living. I’m humbled every day I walk into a squadron by the pilots I have the privilege of working with. My opinion is certainly biased by my experience, but outside of special operations forces, you won’t find a more talented and diverse group of individuals or esprit de corps anywhere else. I’d bet my life on it, and I have. The United States hasn’t lost a single soldier on the ground due to an enemy aircraft since the Korean War. Our military fights under the assumption of air dominance; American ground forces are not attacked from above. Period. The only thing our “boots on the ground” should have to worry about is the amount of ordnance delivered by air assets to help accomplish tactical or strategic objectives, the Close Air Support (CAS) rendered when a friendly position is in danger of being overrun, or in the case of Abu Musab al-Zarqawi, a Time-Sensitive Targeting (TST) opportunity has arisen and needs to be prosecuted. “Fangs” prepares to launch his F-22A Raptor for a training mission at the USAF Weapons School. The fighter community is built on a culture that delivers those effects, enabling us as Americans to fight our wars the way we do. The airplanes themselves are designed to perform at the very limits of what physics allows, and each new generation of fighters produced is more capable and deadly than the one preceding it. The same is expected of the men and women who actually fly them, and that is why fighter pilots are elite. To the chagrin of overly-sensitive and plainly ignorant folk – even the mainstream media – the fighter pilot’s culture is far from politically correct and, dare I say it, it shouldn’t be. An outsider might describe a fighter squadron as “frat boys with cool toys,” and that would be a reasonably accurate assessment. They throw rowdy parties called “roll calls,” where they assign each other callsigns that – in some way, shape, or form -make fun of each other. They drink alcohol in sometimes copious amounts. They sing songs and admittedly some of the tunes are downright filthy and irreverent. They drop the f-bomb—eloquently, even, though sometimes inappropriately and too often. 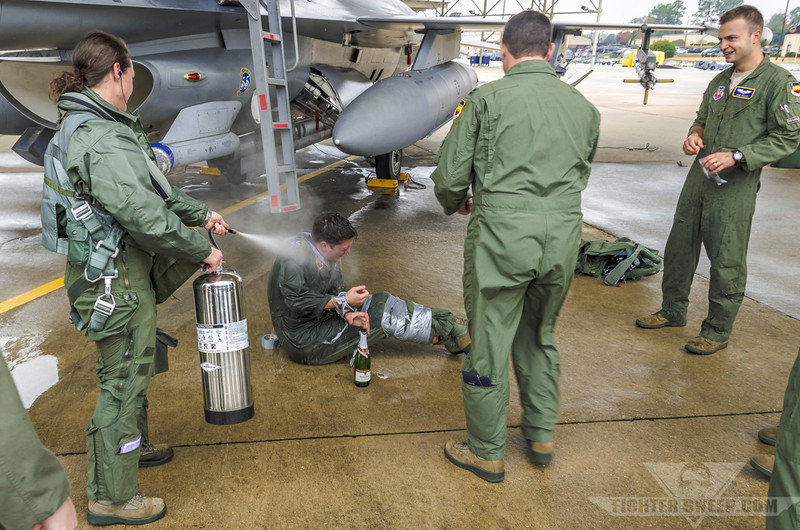 “Chafe” gets hosed down in classic fashion upon completing his last flight with the 55th Fighter Squadron. For all of their faults, you cannot argue their performance. Their job is deadly serious; peace is NOT their profession, and there is no ambiguity when you step into a mission briefing. To do their job, you have to have a certain mindset: not accepting anything less than perfection. That mindset makes them successful, and when you talk about flying high-performance fighter aircraft, that mindset keeps them alive. The rules they live and work by are written in the blood of those that came before them. Air dominance is expected, demanded, and assumed. So consider this group of people, and they’re all incredibly intelligent, physically fit, and very aggressive in their approach to life. You place the expectation on them to kill other people. They learn their enemy is not only men; sometimes women and children are combatants on today’s battlefields. So you’re asking them to do an incredibly tough thing. 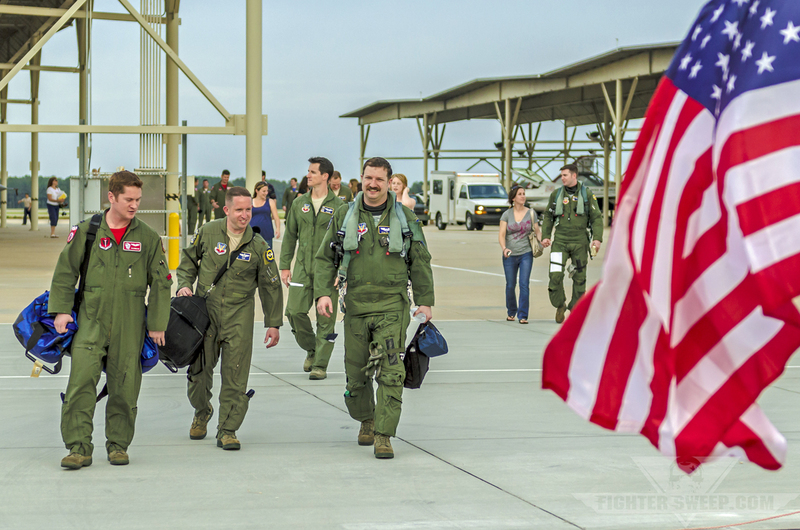 Members of the 55th Fighter Squadron return home after a four-month deployment to Southeast Asia. The United States government spends millions of dollars training them and equipping them for success in their endeavor. Then you place these people in an environment that is unforgiving of mistakes, even in straight and level flight, and your require them to max perform their aircraft in order to gain tactical advantage and kill their enemies either air-to-air or air-to-ground. That also means max performing themselves to the limits of their physical and mental capacity. 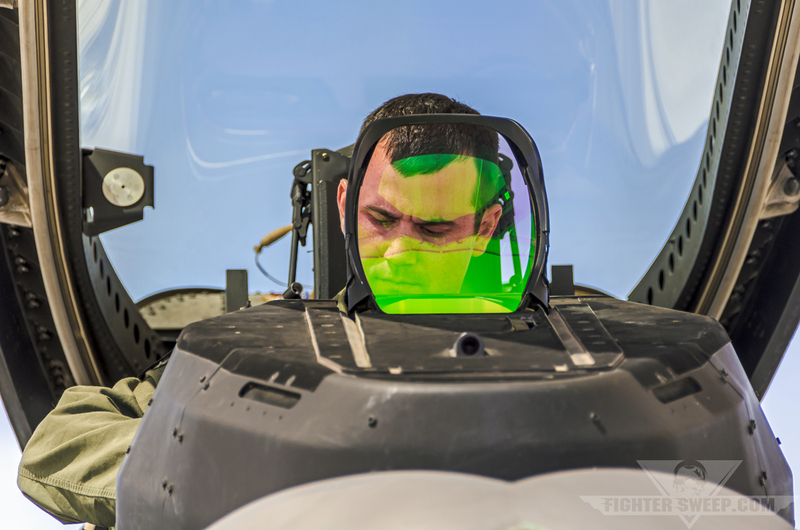 A fighter pilot must maintain their situational awareness, be able to communicate accurately and clearly in very dynamic and chaotic situations, absorb and prioritize information from a staggering number of sources, employ their best tactics under the specific criteria they encounter, and choose the appropriate assets and weaponry for the job – all while staying conscious as the G-load tries to pull the blood out of their brains and subjects them to many, many times their normal body weight. Then things get even more complicated. They have to be able to do this regardless of time of day, weather conditions, terrain features, or other small details – like the fact their enemy also has a state-of-the-art integrated air defense system with SAMs, Triple-A, and fighter aircraft that may be on a par with our own. 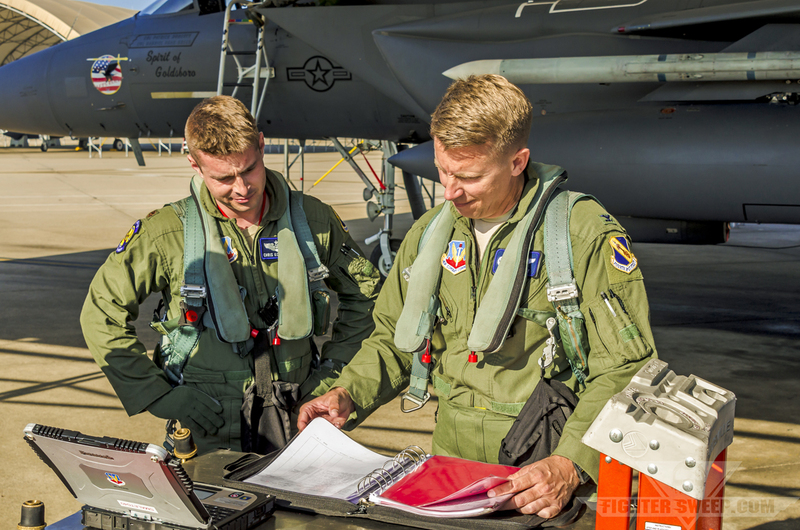 Lieutenant Colonel Cameron “Glover” Dadgar receives his step brief as he prepares to lead a flight of F-16s from the 64th Aggressor Squadron for an evening training mission. Sounds easy, right? Can you imagine this group of people together? In a fighter squadron you have this exact group of people. They are highly trained, keyed up, and required to fly and dominate their battlespace when the physical environment alone is trying to kill them, let alone what the enemy hopes to accomplish. Statistically, in an arena like that, you’re going to find people with questionable morals. Even so, the majority is comprised of really dedicated, straight (as opposed to bent), hard-working people, and they are the ones that are required to keep the amoral in check. Sadly, it doesn’t always work and sometimes the amoral among them create reprehensible situations that make the news. There is no better example than the situation that unfolded at Shaw AFB in the fall of 2012. If you’re unfamiliar, throw the name TSgt Jennifer Smith into your favorite browser. If that isn’t enough, search next for Lieutenant Colonel James “Roscoe” Wilkerson, highly-decorated and respected F-16 pilot at Aviano Air Base in Italy. Or, going way back, consider the Tailhook Scandal of 1991. 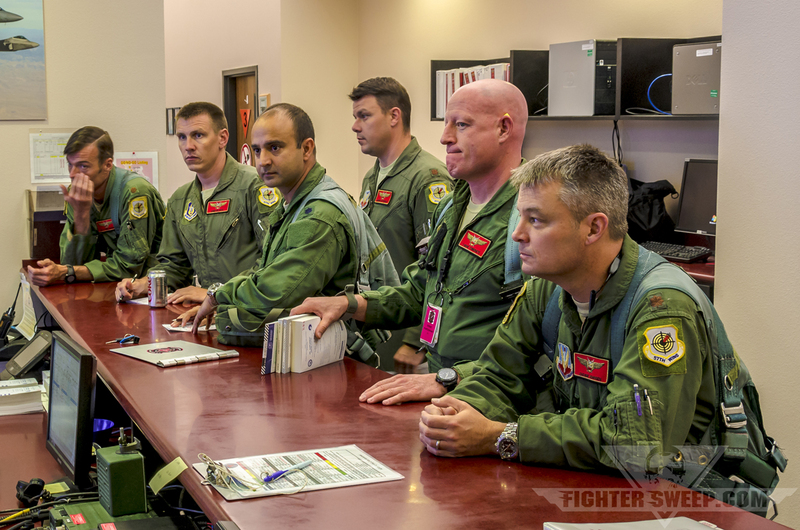 In the next installment, FighterSweep continues to examine the quirks and complications in the world of the modern fighter pilot, addressing important points about accountability and leadership. Stay tuned!